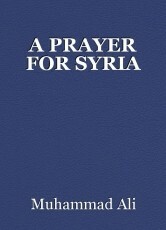 Pray for the People of Syria, where so many are being killed and thousands are fleeing or attempting to flee. Pray that they will be protected and that the peace of Allah will fill their hearts. In the midst of the chaos, pray that Allah will touch every heart with his love, care and peace. Pray that those who have lost loved ones will experience Allahs' peace and faith in the hereafter. Pray that Allah will bring about the resolution to this conflict according to his perfect plan. May peace spring up for the people of Syria, deeply wounded and divided by a conflict which does not spare even the defenseless and reaps innocent victims. AR-RAHMÂN, Hear the cries of the people of Syria, Bring healing to those suffering from the violence, Bring comfort to those mourning the dead, Strengthen Syria’s neighbours in their care and welcome for refugees, And protect those committed to peace. - Amiin ya Rabbi al - Amiin ..
You will never be forgotten - but now we place you in the care of S?rah and Sayyidina Ibr?h?m. Thus wait for us in the meantime: play, smile, be happy! Peace! We will join you soon in Jannah - In shaa Allah - for the start of wonders that will never cease.